What is Travel Signposts and what can it do for me? The Travel Signposts website has been designed to help people who are thinking of taking a vacation in Europe, either on their own, touring by coach or river cruise, or a mixture of different ways, decide where they want to go. We do this by providing you with useful background information to help you plan your trip and especially photos of destinations to give you an idea of what the places are really like. It’s already quite comprehensive, and more importantly, all gathered conveniently together on one site! Travel Signposts also provides Forums where people can exchange information and experiences about their vacations, a newsletter to update you on new developments, and markets owner Tony Page’s TravelTips e-book (soon to be released) and personal book recommendations. Also, in association with Amazon.com, we sell a wide range of travel-related books, photographic equipment, electronics, videos, DVDs, appliances and software (even stuff for travelling with the kids and with baby!). (US only at the moment, we’re working on the UK and Germany Amazons). Who are the people behind Travel Signposts? 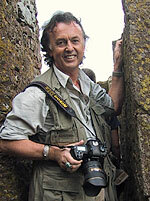 The owners of Travel Signposts are professional photographer and writer Tony Page and his wife, Helen. “We hope our website is going to be useful to you. We’ve tried to make it the kind of place Helen and I would have liked to find when we started touring Europe. I’ve been travelling the world for work and pleasure for over 30 years now (I started off leading expedition tours across Africa in 1974), but when I got married ten years ago I was faced with my wife having limited vacation time at her job – a bit of a shock to someone like me who is used to more or less setting his own schedule! At first I was against the idea of coach touring, as it seemed too regimented, but I wanted to pack as much into Helen’s precious vacation time as possible, without breaking the bank. That was how we eventually came to take our first short coach tour in Italy. To my surprise I found that it was not only cost-effective but enabled us to do an amazing variety of things that would simply have been impossible to fit in if we’d have been travelling on our own. Of course, there are trade-offs, but with careful scrutiny of the various itineraries, reading between the lines of the brochures, careful research and a get-up-and-go attitude on the road, we believe these kind of tours offer a great opportunity to see and experience more of Europe for your money than is otherwise possible. And by combining a tour with time on your own, you can get the best of both worlds! Our main aim in putting together this site has been to give a realistic view of the various destinations. This means if the skies were grey and it was raining, that’s what you see – believe it or not, the skies are not always blue in Europe, in spite of the travel brochures! We’ve kept the images relatively small so that they don’t take too long to load, but in fact most of the original shots were taken either on film or more recently using professional digital equipment, and are available for commercial stock usage on request (the originals look a LOT better!). Some people have already asked us if they can buy some of our shots to fill in the gaps in their own albums for their own use. We are looking into this, and hope to provide an opportunity for you to order prints of a selection of photos online in the future. Until then, why not use our “Send an E-Postcard” facility (there’s a link below every photo, and it’s free!). In the future we will be adding more photographs and more destinations to Travel Signposts, but to start with we have concentrated on the more popular destinations in Europe. Expect to see the European section expanded, we have added our Europe River Cruise Guide and completed our Vienna-Dalmatian Coast-Istanbul destination albums (see Albania, Bosnia-Herzegovina, Bulgaria and Macedonia). The Venice City Guide and the Paris City Guide are now online, and these will be followed by guides to Rome, London and other major cities later. Our most recent trips have been to the European Winter Markets over the 2006-7 holiday season, and Istanbul, the Black Sea, Bulgaria, Romania and Greece in summer of this year. Meanwhile, happy travelling, and we’d love to hear from you!